Formed of a rounded, medially-keeled skull with descending tail fitted at the nape with a quadrangular stem for the attachment of a rondel, struck at the left side with a maker's mark consisting of a crown over a pair of indistinct initials, and fitted at the brow with a reinforce cusped at its upper edge and turned inwards at its lower edge to form the upper margin of the vision-slit; a pair of cheek-pieces hinged to the skull at their upper edges, shaped to the chin and neck, pierced over the ears with ventilation-holes, fitted at their lower edges with the remains of pierced strips for the attachment of a mail aventail, secured to one another at the chin by a turning-pin, and fitted above the pin with a circular stud with sprung lug for the attachment of a reinforcing bevor or 'wrapper'; and detachable demi-visor of 'sparrow's beak' form, flanged outwards at its upper edge to form the lower margin of the vision-slit, pierced at the right side with a hole for the lifting-peg and at both sides with circular and rectangular ventilation-holes, and attached by integral hinges with removable pins to its scalloped and pivoted terminals. Although it has long been recognized that the armourers of Flanders rivalled in importance those of Italy and Germany, it is only in recent years that sufficient evidence has begun to accumulate to allow their products to be distinguished from those of the latter centres. Based mainly in Brussels, Bruges, Antwerp, Tournai and Ghent, the armourers of Flanders rose to particular prominence in the late 15th and early 16th centuries during the reign of Philip the Handsome (1478-1493-1506), who inherited from his mother, Marie of Burgundy, her territories in the Low Countries, and from his father, the Emperor Maximilian I, his passion for armour. Parts of his personal armoury survive not only in the Hofjagd- und Rustkammer, Vienna, but more especially in the Real Armeria, Madrid, where they were deposited by his son, the Emperor Charles V, whose Inventario Illuminado or illustrated inventory of his collections recorded them as viejo que vino de Flandes (old pieces which came from Flanders). The beautifully proportioned armet shown here, bearing a mark of characteristic Flemish type, can be compared in form with two depicted in the Coronation of David in the Musee de Cluny, Paris, painted in Amiens about 1501. Respectively represented from the front and the rear, they clearly show how the straps of the reinforcing bevor or 'wrapper' passed around the rear of the neck and were prevented from sliding down by the stem of the rondel. In the case of the present helmet, the wrapper was also secured by a stud with a sprung lug that projects from its chin. 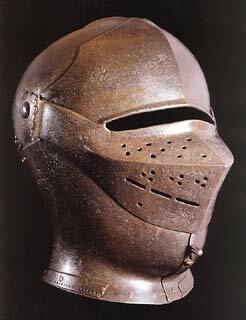 The wrapper was an essential accessory of the armet throughout its history, serving not only to cover the vulnerable join of the two cheek-pieces at the chin, but also to give added protection to the throat that was otherwise protected only by the short aventail of the mail suspended from the lower edges of those cheek-pieces. Armets very like the present example, except that they are provided with full visors that project over the brow, are to be seen in a series of tapestries now divided between the Musee de Cluny, Paris, and the Museo Municipal, Padua, depicting the story of David and Bathsheba, and probably produced by Pieter de Pannemaker of Brussels in 1517. In some cases the lower halves of their visors arc transversely iluted, as on the armet forming part of an armour of Karel van Egmont, Duke of Gelre, preserved in the Cathdral of St Eusebius, Arnhem, and conceivably made by the Arnhem Harnsmaker or armourer Johan van Calis, who in 1518 supplied the Duke with a tournooiharnas or tournament armour. In most cases, however, their visors are simply pierced with circular and rectangular ventilation-holes of the kind seen on the present example. An armet of this type, with a demi-visor, forming part of the 'Silvered and Engraved' armour of King Henry VIII of England in the Royal Armouries at the Tower of London (Inv. No. 1I.V), is struck with a mark similar to that used as a signature by the Flemish armourer Peter Fevers, who was brought from Brussels to work for Henry VIII at Greenwich in 1511. The armour in which this armet is incorporated was decorated for the King in 1515 by Paul van Vreland who had earlier worked for Maximilian I and Philip the Handsome in Brussels, but was persuaded to come arid work for Henry VIII in England in 1514. Flemish armour clearly enjoyed some popularity in England in the late 15th and early 16th centuries. Several jousting helms of that period, formerly suspended over English church monuments as parts of 'funerary achievements', have been found to bear recognisable Flemish armourers' marks. In the Metropolitan Museum of Art, New York (Ace. No. 29.158.52), is an armet of 1510 with a 'frog-mouthed' full visor, showing evidence of having formed part of such an achievement, which bears the mark of a M beneath a crescent, used by an armourer who probably worked for the Emperor Maximilian I and Philip the Handsome in Brussels. It has been suggested that he was the Martin van Royne who subsequently came to work for Henry VIII in 1515. There can be little doubt that when other armets preserved, or formerly preserved, in English churches have been subjected to thorough study, they too will in many cases prove to be of Flemish origin. The present fine and unusually early example of its kind must be seen as a key piece in any such study. Provenance: Konsul A.D. Hans C. Leiden Collection, Cologne. Thanks for this one Nathan. 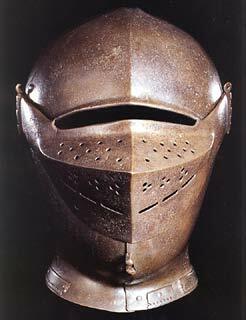 This is my favorite type of helmet from the late middle ages/ early renaissance. Nice inside shot ! Great peak at the construction details . BEAUTIFUL little Sparrow's Beak Armet! What is great is that the serious students of arms and armour can finally begin to identify some of these as Flemish... a few years ago anyone would have simply said "Italian". The illustrations of the day certainly show these to have been in wide use by both French and "Burgundian" heavy cavalry (as well as German and Italian, of course), so it's very good to see such things identified as other than simply Italian imports for a change. 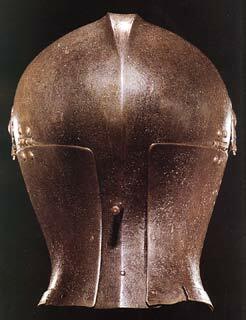 In profile this helm has an almost sculptural quality to it . The anatomical lines of the human head are so crisp and clearly defined in it . Many thanks again for another fine article.This is another absolutely beautiful helmet.Do you by any chance have a picture of the mark ? 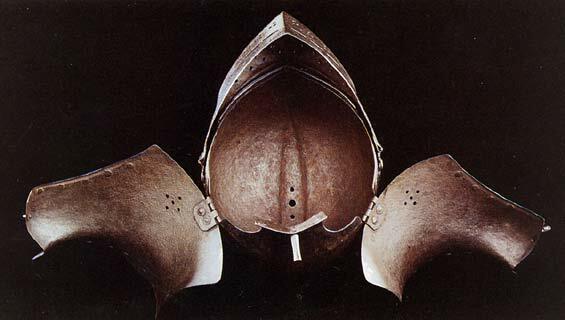 I have looked at this helmet before and though the attribution says that it is Flemish,the overall shape,the little points of detail and above all the shape of the comb suggest south German worksmanship to me,perhaps Ausgburg or better still Innsbruck ? Helmschmied himself made some armets of this type (A.7 KHM),as of course did Seusenhoffer.This one is a bit of a mystery to me ,but I cannot help thinking of possibly German origin and not Flemish.I would love to see that mark if you have a picture please ? 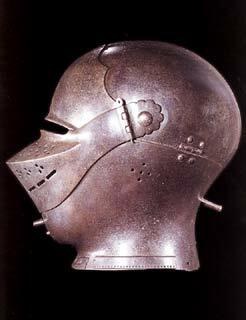 There is another very fine armet in the Metroplotan Museum (1985.259.3),this time more clearly of Flemish or English make, ca.1520. unfortunately now lacking its visor,which I have been talking with Donald J.LaRocca and Stuart W.Phyrr about, which I think could possibly be a very early Greenwich piece,they had evidently been wondering the same thing ! It has little details not normally found elsewhere that suggest ,perhaps, Greenwich manufacture.If the date is correct it could quite possibly be the work of the Martin van Royne mentioned in your article,of Flemish style but made in England. Great article,great pictures,thanks again for another great piece Nathan. Sorry, Russ, these are all the photos I have. Nothing more of the mark.